In LA, for example, the 'underground' drawings of Ray Pettibon - linked initially to the rock scene then distributed through short-run zines - had garnered fervent admirers throughout the late '70s & '80s. A major exhibition in 1992 succeeded in raising his profile both throughout the States and abroad. 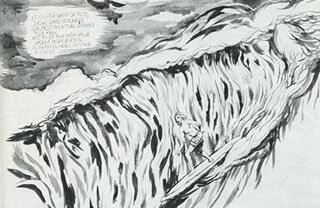 Yet Pettibon's work was merely the best-known facet of a burgeoning counter-culture, one which, since 1986, had found a major advocate in the now legendary La Luz De Jesus gallery in downtown Los Angeles. This space, located incongruously above an offbeat gift store, focused entirely on artists whose backgrounds and influences sprang from an array of popular cultures such as illustration, folk art, comics and tattooing. And this output, crucially, tended towards an intricate figurative craftsmanship more closely associated at the time with illustration than so-called 'fine' art. Resolutely populist - bordering, even, on kitsch - its appropriation of popular style and content within a fine art context questioned long-held assumptions regarding the parameters of art itself. Revisiting the earliest tenets of Pop Art, it nevertheless totally dismissed that movement's later associations with Warholian mass production. And in San Francisco, too, similar trends were underway. In the 1990s a group of artists including Chris Johansen, Clare E Rojas and Barry McGee emerged to form a distinctive new scene. Their work, though sharing much with the Low-Brow phenomenon, differed in several important respects and became known as the 'Mission School' in recognition of its essentially San Franciscan flavor. Local influences contributed to a more whimsical, looser approach to image-making than LA tendencies at the time. Street art such as graffiti formed an intrinsic part of the scene, but was generally refined into a figurative rather than textual medium. The legacy of underground comics pioneered by the likes of Robert Crumb was also evident in cartoon-like characterization and a witty, humorous edge. More importantly still, while painting lay at the heart of the Low-Brow movement, drawing was much more widely adopted by the Mission School artists. In a nod to the hand-drawn agitprop and pyschedelia of '60s Haight-Ashbury, they revived techniques such as detailed patterning, hand-lettering and decoupage. Materials, too, were frequently unconventional; ball-point pens, markers, recycled paper, wood or metal all found a part in the Mission School look. SAN FRANCISCO DRAWING SHOW curated by: Alicia McCarthy and Chris Johanson. May 19 - June 17, 2000. Straight out of San Francisco, drawings of over 15 artists will be exhibited .... Currently there are important artistic trends developing out of San Francisco. Drawing is at the root of this development. Meanwhile, however, America's East Coast found itself forced (for once) to gradually acknowledge a nexus of creativity occurring elsewhere. While many commentators, curators and gallerists became increasingly aware that some kind of real cultural shift was taking place, others seemed slow or simply unwilling to recognize its impact or legitimacy. Yet the growing appeal of Low-Brow and related work - especially amongst a generation of new and emerging artists - was undeniable. New galleries opened to deal exclusively in the genre, and Juxtapoz, along with many of its featured artists, began to acquire a cult following. Its international distribution and the broad reach of the internet helped ensure that this new sensibility filtered beyond the US. The 'unofficial' Californian scene gathering pace in the '90s was intrinsically linked to a rejection of prevailing artistic practice - the notion, as Fred Tomaselli later put it, "...that people are a bit tired of the over-rationalism (sic) of the art world, this idea that you can get to everything through the cerebral." But this interest - and with it, the resurgence of a particular kind of artistic engagement - was not, of course, solely confined to America's West Coast. 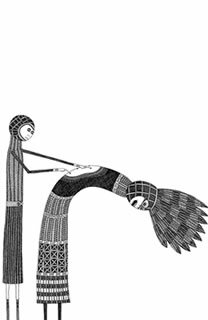 Elsewhere in the States, Laylah Ali's first major show of meticulously patterned, faux-naif works took place at Chicago's MOCA in 1999 (she had been featured, along with Chris Johansen, at New York's Drawing Center in the summer of 1998). Julie Mehretu, likewise emerging towards the end of the '90s, fused painting with drawing in a myriad of complex mark-making, while Canada's Royal Art Lodge, formed in 1996, produced whimsical drawings, paintings and objects reminiscent of the Mission School's output. In Europe, similar trends were also underway. As the 20th century drew to its close, Sweden's Jockum Nordstrom was gaining recognition for his beautifully rendered, twisted tableaux of far from ordinary life. 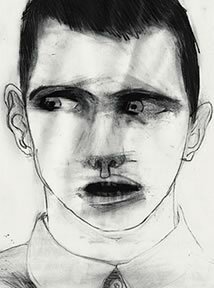 Switzerland's Marc Bauer produced vigorous drawings that exemplified the medium's strength, and in Britain the hand-drawn zine was adopted by Olivia Plender, albeit in a highly polished form. While drawing, obviously, had never disappeared entirely from the gallery, these artists represent just a few of those contributing to its rapidly growing visibility towards the end of the '90s. A resurgence now so evident that, though prompted by certain definable factors, it nevertheless seems organic, almost essential; a phenomenon that quite possibly identifies as well as answers very current needs amongst today's young artists.